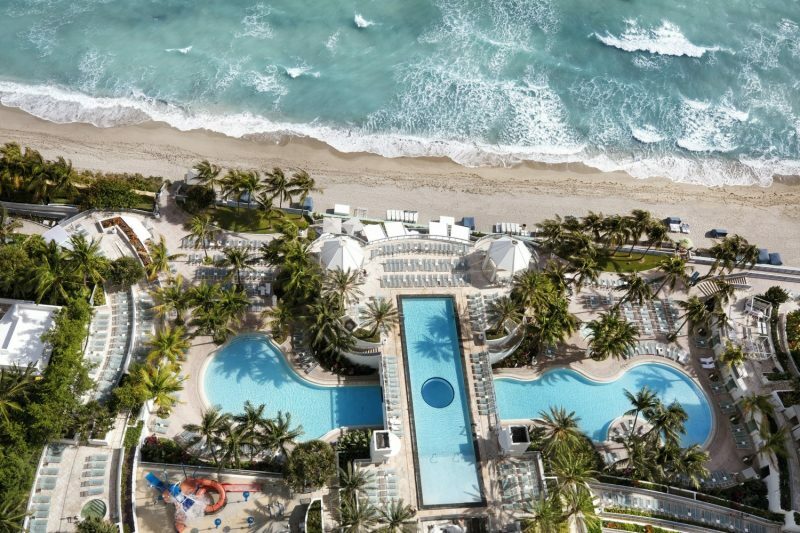 After a $100 million renovation The Diplomat Beach Resort situated in Hollywood, Florida is an iconic beach resort, reborn. The Diplomat brings that old school hospitality back, wrapped in a spirited escape-to-sunny-shores feeling. With the mission to connect, recharge and recreate, guests will find themselves immersed in a variety of activities, experiences and opportunities. The sprawling property features 1,000 luxuriously appointed rooms and suites which were designed to be comfortable retreats. 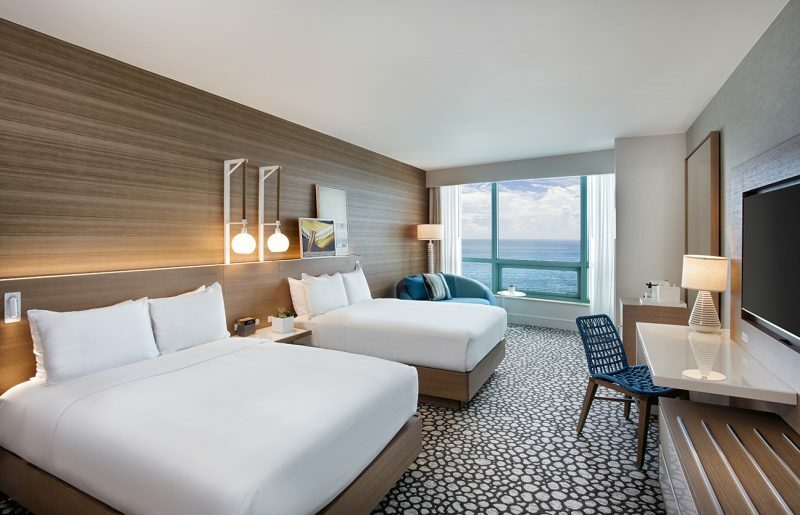 The décor is sleek and sophisticated touching on contemporary furnishings and amenities, with floor to ceiling windows offering breathtaking views of the ocean and the Florida skyline. 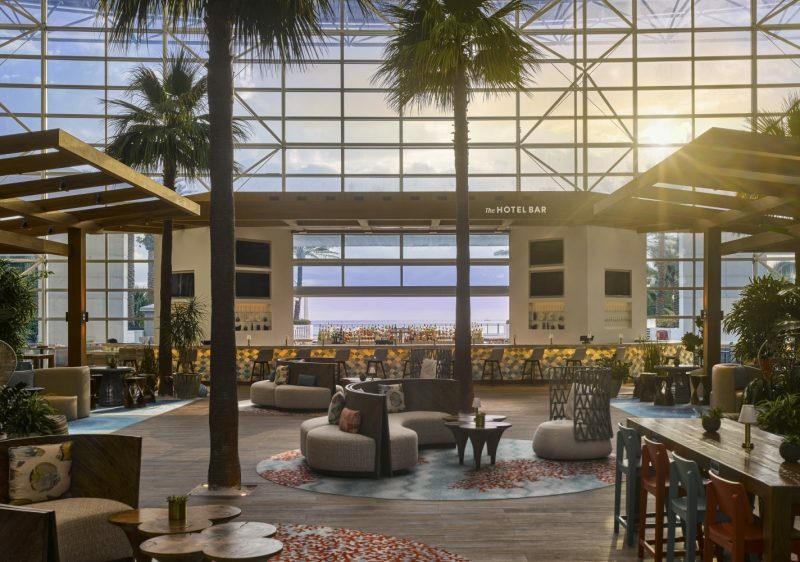 The culinary program is led by celebrity chefs alongside local Hollywood chefs in conjunction with world-class mixologists making The Diplomat Beach Resort a true foodie’s mecca. Patrons can choose to dine at a signature steakhouse Diplomat Prime or revel in coastal American cuisine at Point Royal. The Hotel Bar is an indoor-outdoor bar perfect for socializing with friends, while sipping on iconic cocktails based on famous hotels around the world. If you have an extensive itinerary planned to make the most out of this sprawling resort, the Grab-and-Go sections from the casual market, The Canteen is your one stop shop for all your brief dining needs. Take in the beautiful views of the Intracoastal Waterways at Bristol’s Burgers or Portico Beer and Wine Garden for good food and a good atmosphere. For festive South of the Border options dine at Nuevo Latino Playa, which is taco heaven. 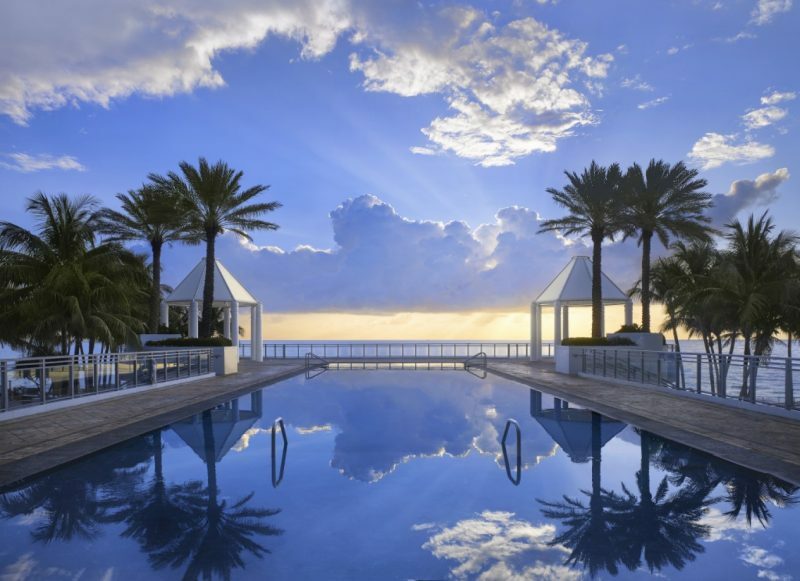 As a family friendly destination, The Diplomat Resort offers a range of activities for all ages. The kid’s club provides peace of mind for parents, as kids will fill their day with beachy adventures while the parents enjoy some grown up fun in the spa, at the pool or jet skiing in the ocean. A beautiful and serene 18-hole golf course is perfect for the dads who want to improve their game while on holiday. For moms, Aventura Mall is one of the many shopping destinations complete with big department stores to luxurious brands and unique independent boutiques where you may just find your next treasure. For off price shopping, The Colonnade Outlets feature top luxury designers including Prada, Kate Spade, Saks Off 5th and more. For a more adventurous shopping experience, catch the water taxi to Las Olas Boulevard for a day browsing fashion, art and specialty shops along the chic downtown shopping and dining district of Fort Lauderdale. To arrange transportation to any of these fabulous shopping destinations contact the concierge who will arrange everything. Take the time to explore the charming coastal town of Hollywood, FL, where the nightlife is alive and everything you might want to see or experience in South Florida is just moments away. Almost every day, the town holds community events whether it’s their summertime moonlight sea turtle program where you will see the turtles emerge from the waters to nest on the beaches, or witness glass blowing at the arts park. Savor delicious bites from more than 20 of South Florida’s most popular food trucks or browse the works of local artists and photographers along the new river walk. You can even catch a movie at the Arthouse cinema with a daily schedule of foreign and independent films, retro movies, and documentaries in a beautifully renovated historic building. South Florida is known for its turquoise waters, so it would be a shame to stay so close to the waters but not experience them. At The Diplomat Beach Resort there are a variety of water activities available such as jet skiing, ocean kayaking, paddle boarding and pontoon boat rentals are available for a fun filled day with the family exploring secluded islands or a romantic sunset cruise on the coastal waterways. Sail away on a catamaran or try kayaking, swimming or relaxing in the warm tropical sun on one of the giant hammocks they offer. Sailing and yacht charters are also available for a luxurious experience on South Florida’s waters. Enjoy the amenities of the resort and indulge in your own private escape with the solitude of a private cabana, located above Lagoon Pool. The cozy sanctuaries are bountiful feature plush interior seating with table, sun umbrella, chaise lounge, towel service and a warm welcome basket, complete with snacks, chips, juice and iced tea. Poolside cabanas are also available and make for a perfect comfortable haven for a day by the pool. If the beach is what you’re looking for, the beachside service has everything covered. Channel your inner spirit with Yoga on the beach, designed to open up your mind, body and heart while on vacation. There is also a fitness center available stocked with state of the art equipment and private training sessions and group exercise activities to help maintain your best self. The two-story fitness center features an elevated cardio deck with elliptical, treadmills and stationary bikes all with integrated docking stations. Complimentary amenities include water, towels, earbuds and magazines for your benefit. After a long day of paddling in the gorgeous blue waters of Florida, and spending some quality time with the family, The Diplomat Spa welcomes you into a world that nourishes the mind, body and soul for the ultimate relaxation experience. With offerings of healing massages, cleansing facials and energizing body treatments, you are guaranteed to leave feeling refreshed and rejuvenated. The relaxation room contains a mesmerizing rain wall that invites calm and the halotherapy salt steam room and sauna welcomes purification. Nourish your body with gourmet cuisine at the Ocean view Spa Lounge overlooking the Atlantic Ocean. The Diplomat Beach Resort is everything you want in a luxury resort, offering nothing but the best, in quality and affluence. You can be assured there is plenty to do and see at this resort, with a range of activities from water sports to cabanas by the pool, kids club and endless culinary options. The Diplomat Beach Resort redefines the meaning of a resort with a stylish flair, modern amenities and endless opportunities for fun with the family.